At least 300 million children around the world live in regions that experience extreme air pollution, and many of these children are living in poverty and at heightened risk from conflicts, crises and impact of climate change. According to the UNICEF study—the first of its kind study that analysed satellite data—toxic fumes in these regions are more than six times the international guidelines. Moreover, about 90 per cent of the world’s children—two billion—live in places where outdoor air pollution far exceeds World Health Organization (WHO) limits. In fact, nine out of 10 people in the world live in places where air quality levels breach WHO safe limits. Every year, about 600,000 children under the age of five die from diseases linked to indoor and outdoor air pollution. The number of child deaths is more than the casualties caused by malaria and HIV/AIDS combined. Children are far more vulnerable to air pollution because they breathe more rapidly than adults. The cell layer in their lungs is also more permeable to pollutant particles that can cross the blood-brain barrier causing permanent harm to cognitive development and. Air pollution also affects the unborn as the particles inhaled by pregnant mothers can cross the placental barrier (also known as “leakiest barrier”), thus injuring fetuses. Over three million people a year (six people very minute) die due to outdoor air pollution. It is likely to double by 2050. Similarly, indoor air pollution, mainly from wood or dung stoves, causes three million deaths a year. Of the 300 million exposed to extreme levels of pollution (six times over WHO limits), 220 million live in South Asia, especially India, which is home to many of the world’s most polluted cities. 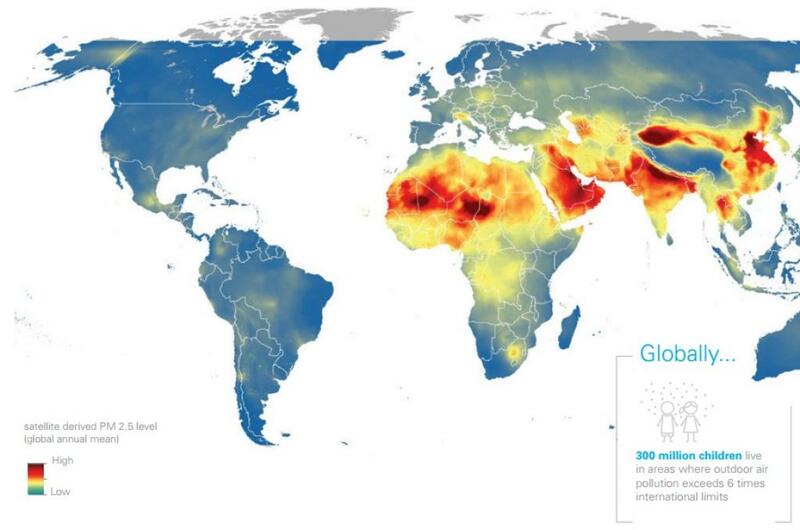 South Asia (620 million) has the largest number of children living in areas where air pollution exceeds WHO limits. Africa is a close second with 520 million children at risk. The East Asia and Pacific region has 450 million children living in such areas. Children in developing countries are more vulnerable to air pollution as they have little resistance due to poor nutrition and insufficient health care. Lack of access to clean water, adequate sanitation and hygiene makes cases of respiratory infections like pneumonia more common and potentially more deadly. According to the report, Bangladesh has one of the largest burdens of child mortality linked to indoor air pollution. Over 8,500 children die each year due to diseases caused by household air pollution (HAP) and 89 per cent of households use solid fuel—wood, agricultural waste and cow dung—for cooking and heating. Ulaanbaatar, the capital of Mongolia, experiences worst air pollution during the harsh and prolonged winters. At times, air quality in the city gets worse than Beijing and Delhi. In Europe, 120 million children live in areas where outdoor air pollution exceeds WHO limits and 20 million children are exposed to pollution level that is more than double the limit. The UNICEF is urging world leaders attending COP 22 in November to reduce air pollution by cutting down fossil fuel burning in power plants and vehicles. According to the World Bank estimates, the welfare losses from air pollution are more than $5 trillion a year. The report calls for taking four urgent actions to protect children from air pollution. Reduce pollution: Governments should make greater investment in energy efficiency and renewable energy sources to meet WHO global air quality guidelines to enhance the safety and wellbeing of children. Increase access to healthcare: Investing in children’s healthcare, including immunisation campaigns and community awareness will improve their resilience to air pollution and their ability to recover from diseases and conditions linked to it. 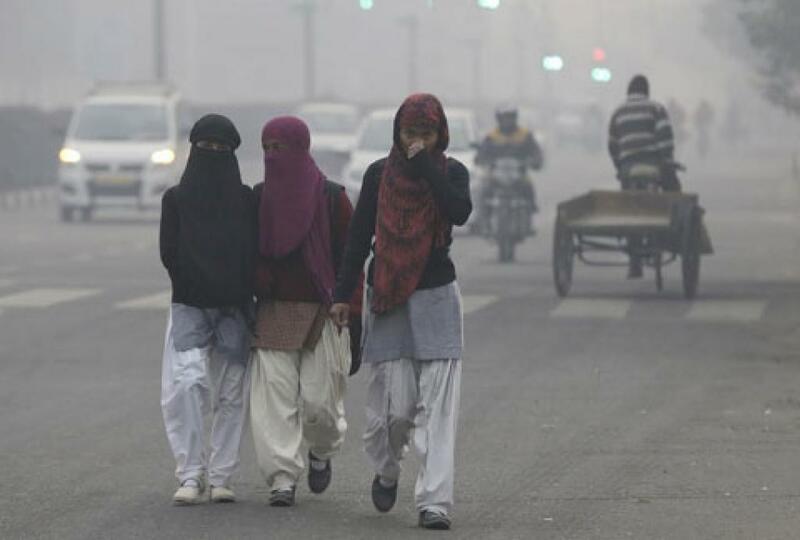 Minimise children’s exposure: Sources of pollution like factories should be located away from schools and playgrounds. Preventing waste burning within communities is also recommended. Cleaner cooking stoves can help improve air quality within homes. Monitor air pollution: Better monitoring helps children, families and communities to reduce their exposure to air pollution as they become more informed about its causes. A recent UNICEF report has stated how toxic air damages a child’s brain, leading to anxiety, and development delays. Here’s what you can do to keep yourself and your child safe.